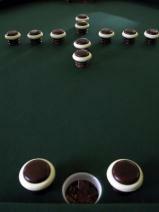 The history of the table game “pocket billiards,” often referred to as “pool,” is really something of a mystery. In all likelihood, the game as we know it today is an evolutionary relative of croquet, or at least some similar outdoor ball-and-mallet lawn game. One thing is for certain: the game has gone through a very long list of permutations, and produced a number of spinoffs, from carom to bumper pool tables. The goal of croquet, a French lawn game, involves moving a ball through a gauntlet of hoops to reach a distinct destination by hitting it with a wooden mallet. At some point, this game was moved indoors. 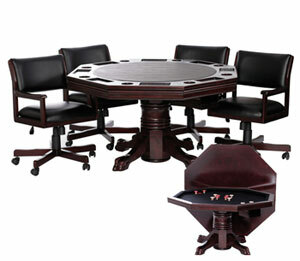 Over time, however, perhaps on account of lower back pains, players decided to transfer the game to a table. 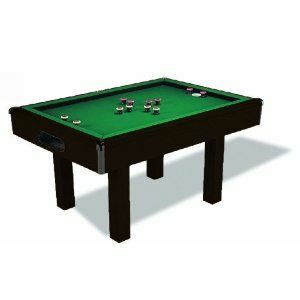 Since the balls had a tendency to fall off the table, wooden railings or bumpers were eventually incorporated in billiard table designs. Then the game evolved to include two pockets, rather than two cones or sticks, as goals. This setup gave rise to more pockets, and that brings us to billiards as we know it today. Shakespeare was aware of the game of billiards, as he referenced it in his play Anthony and Cleopatra. Pool tables were, in fact, rather common in England. Although many distinct games with individual rules are played on it, the pool table itself is generally unchanged since it was mass-produced in the mid 19th century by the Brunswick Company in the United States. 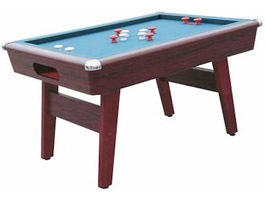 Billiards, carom, and many of their variations may be played on a modern standard pool table. 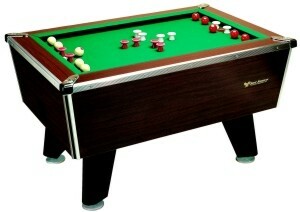 But not everyone can afford full pool tables, which are both expensive and rather large. Few homes have rooms big enough to truly support a full size billiards table. 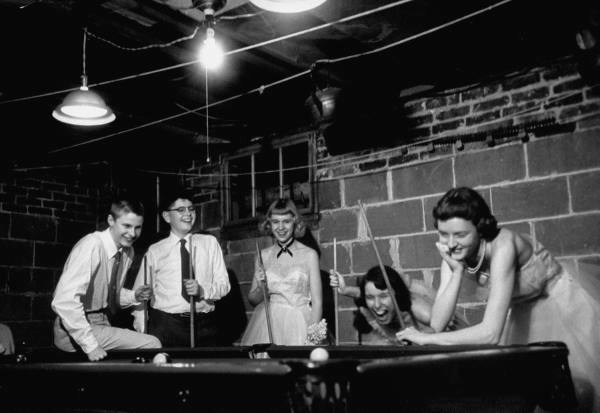 Luckily, in the last century the game of Bumper pool was developed. 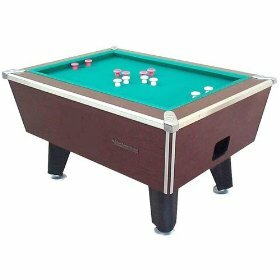 Bumper pool tables are octagonal in shape, rather than rectangular, and as such are much more space-efficient than full size pool tables. They are also smaller in general. Even the pool sticks and pool cues are smaller for bumper pool tables. Unlike traditional pool, there are only two pockets in bumper pool: one for each player. Additionally, there is no “cue” ball. Rather, each ball (5 per person) is shot directly and individually in an attempt to sink them all in the opposing pocket. Sounds easy so far? The most prominent difference between bumper pool and traditional pool is the former’s utilization of obstacles. Every bumper pool table comes equipped with 12 to 14 rubber pegs, called “bumpers,” that are situated upright in the center of the table, forming a large “X” shape. There is just enough space between each bumper to let a single ball pass through. Therefore, the strategy in bumper pool consists of lining up well angled shots that bank off the walls, through the bumper gauntlet, and into the goal pocket. In many ways bumper pool tables take the technical difficulty of traditional pool and make it even harder, forcing every player to be clever with his or her shots. Although there is no set “defensive” strategy, there is still a lot of careful planning involved in every single shot. 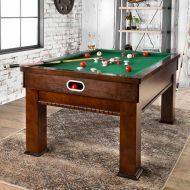 Not only is a bumper pool table a unique challenge to pool lovers everywhere, it is also a very affordable and space friendly way to bring your favorite billiards games into your very own home. The game of pool, a favorite throughout history, just got a little more interesting.